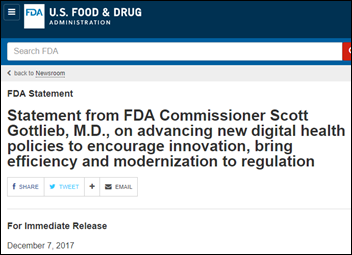 FDA will focus its attention and medical device status on software that analyzes medical images, physiological monitoring data, sound waves, sleep apnea monitor data, spectroscopy data, and slide pathology, as well as software that uses undisclosed algorithms. Uses patient information to present treatment guidelines and drug interaction / allergy alerts. Offers prioritized alternatives to orders and drugs using generally accepted practices. 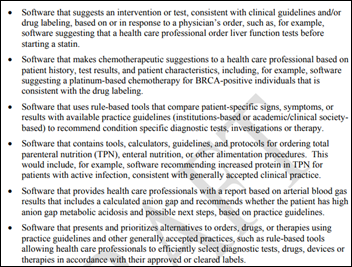 Suggests an intervention or a test consistent with clinical guidelines or drug labeling. Uses rule-based tools to compare patient data to practice guidelines. Provides tools, calculators, or protocols for TPN or enteral nutrition. Provides patients with prescription reminders and instructions that are consistent with FDA labeling. Helps patients choose a non-prescription drug based on their symptoms. Is intended only for healthcare facility use. Allows patients to document or illustrate their conditions with their providers. 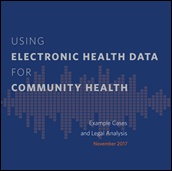 FDA also says it will not enforce its own requirement that electronic patient software be classified as a medical device if it isn’t certified by ONC. Software that stores, converts, or displays medical images will also be moved to non-device status, but software that analyzes the images will be treated as a medical device. Software that flags patient results based on specific parameters (such as out-of-range results or opportunities for complementary tests) will not be regulated as a medical device as long as it only performs the same interpretation that the practitioner could do themselves. STEM games for Mrs. S’s fourth-grade class in Columbus, OH. A mobile science lab for Mrs. N’s middle school class in Bay Shore, NY. Ten sets of headphones for Ms. M’s elementary school class in Philadelphia, PA.
A library of 30 fiction and non-fiction books for Ms. E’s elementary school class in Bronx, NY. A carbon dioxide meter and air quality mapping supplies for Mrs. E’s elementary school class in Detroit, MI. A STEM activity table for Mrs. S’s elementary school class in Malden, MA. STEM activity centers for Ms. Z’s pre-kindergarten class in Fort Worth, TX. Air quality meters for Mrs. A’s fifth-grade class in Greenville, PA.
A three-day environmental science mountain camping trip for Mrs. V’s fifth-grade class in Los Angeles, CA. This week on HIStalk Practice: Burke Pediatrics (VA) partners with Food for Others as part of a new food prescription program aimed at ensuring patients can put healthy food on their tables. The Y builds out health IT infrastructure with HIPAA compliance, cybersecurity services. Teladoc drops lawsuit against Texas Medical Board. AJC investigation highlights physician contributions to opioid epidemic. CyberKnife Center of Miami selects Identillect. Aprima integrates DocBuddy voice recognition. HealthiPass raises $7.2 million. UnitedHealth buys DaVita Medical Group in multi-billion dollar deal. 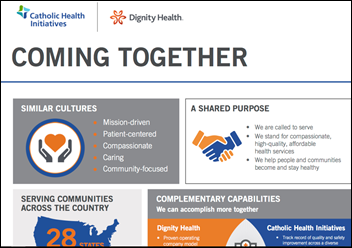 Dignity Health and Catholic Health Initiatives sign a merger agreement that will create the country’s largest health system as measured by operating revenue. The new Catholic health system will have $28 billion in revenue, 139 hospitals, and 159,000 employees, operating in 28 states. The CEOs of each organization will become co-CEOs of the new system. 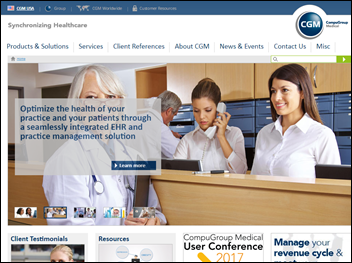 Dignity uses Cerner, while I believe CHI runs a mix of Meditech, Allscripts, Cerner, and Epic. I’m interested that the asset management company co-owned by Nobel-winning economist Richard Thaler – which focuses on shares that are mispriced due to irrational investor psychology – holds 2.8 percent of the outstanding shares of Allscripts, worth around $72 million. MDRX shares are up around 12 percent over the past 12 months (vs. the Nasdaq’s 48 percent) and 30 percent over the past five years (vs. the Nasdaq’s 129 percent). 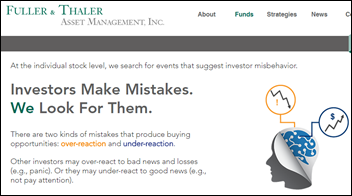 It’s Thaler’s theories rather than his investing acumen that earned him a Nobel — the Fuller & Thaler Behavioral Small-Cap Equity fund has performed consistently worse over several years than the Dow, Nasdaq, and S&P 500. A Huffington Post article profiles ReHAP, an algorithm-driven system for hospitals to help hospital rehab therapists identify and prioritize patients who need their services. The co-founder is Krishnaj Gourab, MBBS, who is chair and medical director of rehab informatics and analytics at Johns Hopkins Bayview Medical Center (MD). 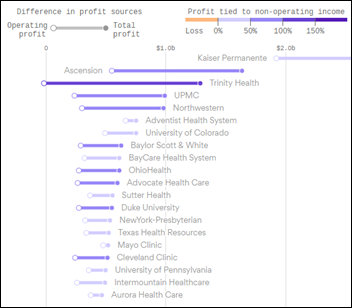 An Axios financial analysis of 84 large health systems finds that while their patient care margins are slim, they’re making a fortune with their Wall Street investments and M&A activity in raising their overall average profit margin to 6.7 percent on their huge revenue volumes, with the article concluding, “Large not-for-profit hospital systems now resemble and act like Fortune 500 companies instead of the charities they were often built as. They consequently hold immense financial and political power.” The analysis unfortunately and rather obviously mixes up “millions” with “billions” in the pop-up graph legends, but commendably provides the raw data as Google Docs spreadsheet. The most profitable health system is Kaiser Permanente at $3.1 billion in FY2016-27 profit, of which 38 percent was generated by its investments. To take the counterpoint, one contributing factor in the success of any charity is to accumulate enough assets to iron out the operational cash flow challenges, although people often get suspicious when those war chests swell and executives take home multi-million dollar salaries. Not to mention that the stock market won’t always perform as well as it has lately. Anil Sethi, MS – who became director of Apple Health in 2016 after the company acquired his personal health record company Gliimpse — will leave Apple to focus on his new startup Ciitizen. Former ONC Chief Privacy Officer Deven McGraw, JD, MPH also works for Ciitizen, which helps people obtain and share information and health-related legal documents. Medical Society of Delaware chooses HealthEC’s population health management system and services for its 900-doctor clinically integrated network. 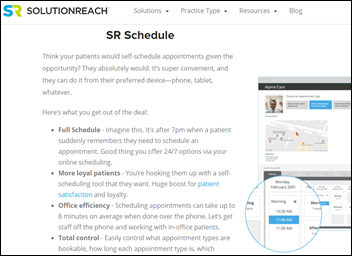 Solutionreach announces SR Schedule, which allows physician practices to offer the patients easy self-scheduling. 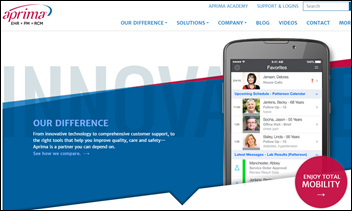 Aprima integrates its EHR with DocBuddy voice-powered physician workflow for mobile devices. A hand surgeon early adopter says it saves him 45 minutes per day. 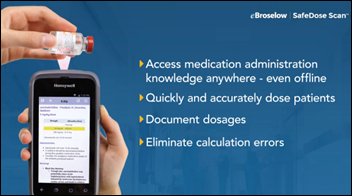 EBroselow will integrate ASHP’s AHFS DI Essentials database into its SafeDose bedside dosing application. The rate of growth of US healthcare spending slowed in 2016, but still increased by $354 per capita to $10,348 in consuming 17.9 percent of the gross domestic product. 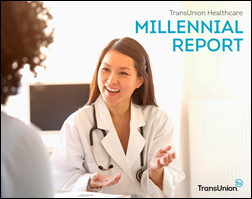 A TransUnion report on Millennials finds that 60 percent don’t understand their health insurance benefits. 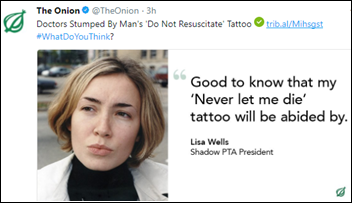 They also also pay their medical bills more slowly than other generations, mostly because they entered the workforce as lower-income employees just as employers shifted more healthcare payments onto consumers and thus they don’t have the money. The report suggests that providers educate Millennial patients at the point of service, give them an upfront cost estimate when possible, and encourage them to pay at the time of service. The Indianapolis paper profiles Chuck Dietzen, MD, medical director for pediatric rehabilitation at Riley Children’s Health (IN); founder of the non-profit Timmy Global Health; and co-founder and chief medical officer of EHR/PM vendor ISalus Healthcare. 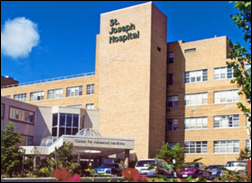 St. Joseph Healthcare (ME) will eliminate 24 jobs as parent organization Covenant Health centralizes billing after completing its Cerner implementation. LogicStream Health launches clinical process modules for sepsis, CAUTI, and VTE.